This event is one of the largest and most well-attended in St. Louis, showcasing food, art, music and culture. Every culinary delight you can imagine will be available for purchase on Sauce Magazine’s Restaurant Row, including Kakao. 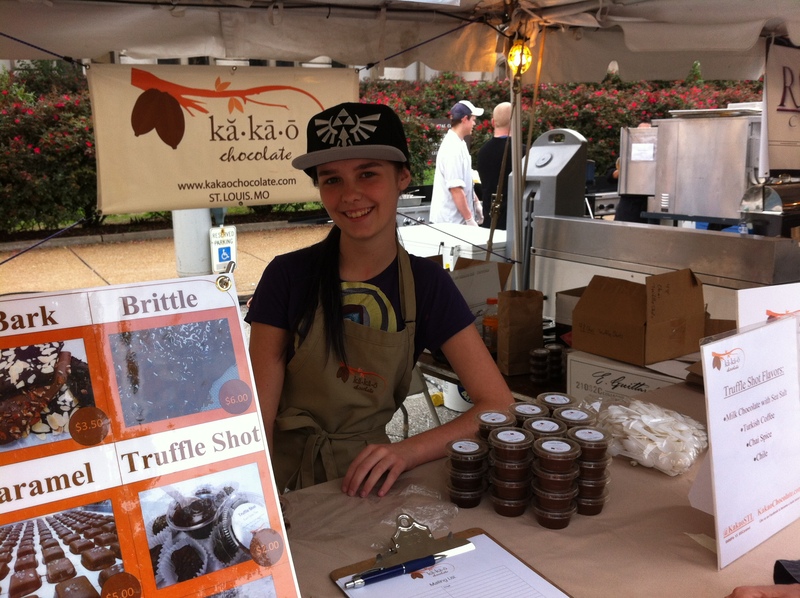 We will have some of our favorite goodies on hand: several classic varieties of chocolate barks and bars, sea salt caramels, marshmallow pies, bacon brittle, and truffle shots. Also check us out at the 314 Hot Sauce Showcase Stage and Dining Area on Sunday at 5pm where Brian will present Get Your Chocolate On! Also keep an eye out for our friends Local Harvest Cafe (they sell our chocolate and hot chocolate), Naked Bacon (we make some of our candies from their bacon), Park Avenue Coffee/Ann & Allen Baking Company (they sell our chocolate and we sell gooey butter cakes they make with our ice cream sauces) and The Cup (we collaborate with them on their cupcakes) among many others. Check out the Culinary Stage for award-winning St. Louis chefs and brewmasters as well as the Stella Artois Chef Battle Royale (http://www.tastestl.com/chef-battle/). Over two dozen brewers will staff the Beers of the World experience, where tasting size samples will be available for purchase. Free music includes performances by St. Louis’ own Pokey LaFarge, Robert Randolph and the Family Band, The Samples and The Dusty 45s, among many others. Tickets are available for Russo’s VIP lounge where guests will be treated to drinks, upscale hors d’oeuvres, music and private restrooms. Discover the Artwalk, featuring dozens of artists selling their wares. The Marketplace will showcase local and national businesses. And there’s lots of fun for kids in Kid City: Saturday and Sunday 11am-5:30pm kids can enjoy learning about safety, recycling, farming, and more! Metrolink is recommended as parking may be difficult (and probably costly). Visit http://www.tastestl.com/ for details and important information about the rules for attendance (such as no coolers or pets).